Massachusetts Gov. 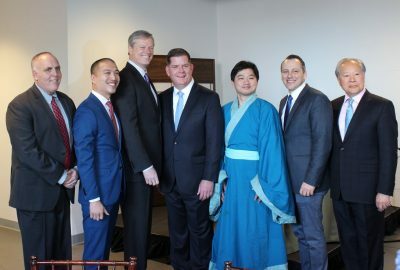 Charlie Baker and Boston Mayor Martin Walsh attended the Boston Chinatown Neighborhood Center’s 50th anniversary tea ceremony on Friday at the Pao Arts Center in Chinatown. BCNC is an organization that services Asian immigrants and Asian Americans in Greater Boston. The organization serves 8,000 people in four locations in Boston and Quincy, Giles Li, BCNC’s executive director, said. “Fifty years later we are still creating pathways for the most vulnerable in our communities to a brighter future, and we are continuing to expand our impact,” Li said. Also in attendance at the ceremony was Boston City Councilor Ed Flynn, who represents District 2, and Councilor At-Large Michelle Wu. Walsh congratulated BCNC on their 50th anniversary and on the work they have done through the years, especially in helping immigrant communities with child care and education, workforce development and intergenerational support. In Boston, Walsh said, 20 percent of residents are foreign born, and 48 percent of residents are first generation, like himself. 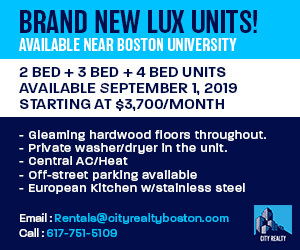 Walsh said Boston’s Office of Immigrant Advancement works closely with residents on matters such as citizenship applications, legal services and basic city services. Baker said during the ceremony that the 50-year anniversary was a significant accomplishment for BCNC. “Clearly this organization has been all about providing a bridge and an opportunity and possibility for the families and the people of Chinatown and Quincy for a very long time,” Baker said. BCNC greatly benefits the community it serves, Baker said. “One of the things that this organization provides is a real sense of community and a real sense of connection with the folks that are part of this community and part of this region,” Baker said. After their remarks, Baker and Walsh participated in the traditional tea ceremony, in which participants served the person beside them oolong tea, and Walsh served Baker.